Three things I’m working on for 2011 is my attitude, blogging more, and loosing weight. I’m making progress with two of my 3 themes for the year: attitude and blogging. This may be the longest streak I’ve had in blogging, ever. I’ve posted every day since March 28th. This is from the Daily Post on April 30. I’m a little behind in replying to it. One of the tricks I use to post regularly is to schedule posts in advance. I am able to write when I have time and try to stay about a week ahead. A result is that when I respond to the Daily Post or Plinky may be days after the prompt was posted. So back to the topic of the day. As of April 30th I was half way through the Post A Day Challenge. I decided to do the PostAWeek rather than a PostADay but really I’m posting almost every day. 14 May — Lunch Box Police? A Chicago public school, Little Village Academy has banned lunches from home. The school not requires all students to buy a school lunch for $2.25 a day. The only exemption to the rule is if the child has food allergies. The schools say this is necessary to improve students health. Children’s Success Academy in Tucson, AZ has banned white flour, refined sugar and processed foods. The schools justify their extreme actions by saying it is promoting better health of students. More .. 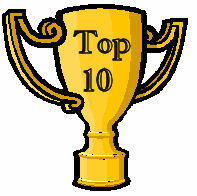 The challenge from the Daily Post Blog is to make a Top 10 list of favorite things I haven’t done in over a year. I’m not sure if everything on my list has been over a year but it seems like it.